Last week, seven of the public relations industry’s top PR professionals offered unusually candid insights into one of the hottest issues of the day – corporate activism. Values-Based Decision Making in a Provocative Environment was produced by the Museum of Public Relations, which has grown into an impressive thought leadership organization since its founding by Shelley Spector. The panelists agreed that most corporations need to build trust by conducting themselves with transparency, honesty, and finesse. What’s more, today’s public increasingly expects corporate leaders to take a stand on social issues. That’s great news for the PR teams who support such organizations, but it does warrant a careful approach. When embarking on an issues campaign, public relations pros should make it relevant to stakeholders, engage their employees, consider their customers’ values, and be prepared for blowback. 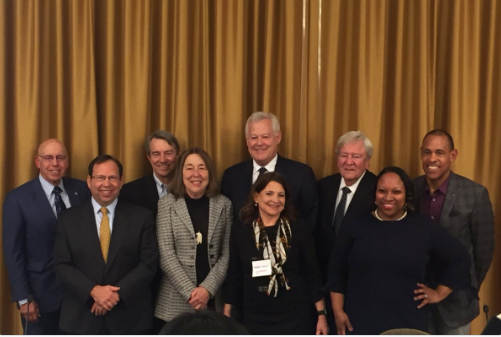 Here are highlights from the corporate activism panel discussion, which included executives from Weber Shandwick, Johnson & Johnson, and General Electric. Event panelists worked through some of the most well-known episodes in PR history, including the 1982 Tylenol poisoning crisis (Johnson & Johnson). Some had come of age in the days before digital and social media, then lived through the extraordinary communications revolution that transformed the nature of information. They bring a valuable perspective to the state of today’s communications. Not so long ago, public communication was a one-way process; organizations sent press releases and news statements to media for public consumption. Today, PR is a two-way conversation, and the sheer volume of news has exploded. The role of the Chief Communications Officer has therefore grown in importance. The CCOs working today have the opportunity to make a great impact on society. But it’s easier said than done. As pointed out by several panelists, emerging generations place a particular premium on truth. Bill Nielsen, retired Chief Public Relations & Communications Officer for Johnson & Johnson, believes that the PR and journalism industries share a common currency: dedication to facts. A healthy journalism sector and corporate communications driven by honesty and authenticity will elevate the public dialogue and strengthen our institutions. As we have seen, flawed journalism and phony corporate speech will only weaken public confidence and degrade the national conversation. It’s a downward spiral. As Johnson & Johnson CCO Michael Sneed pointed out, in today’s communications arena, companies have a social contract with society and must earn the license to do business. But, some corporations fall victim to short-term thinking, or they don’t know how to engage in a more challenging social environment. Several panelists offered observations and advice to communicators who want to gain (or regain) public trust, particularly among rising generations. Your company just needs to do good things and get on the right side of whatever issue arises. Simple, right? No. And it’s important to recognize that fact. “People mistake ethical decision-making for deciding what’s right and what’s wrong. Most ethical crises are (difficult) moral dilemmas,” said Roger Fine, the retired J&J General Counsel. Before you broadcast your position to the world, you must consider how various stakeholders will react. Expect pushback, because it will probably come. Today’s PR teams are working in uncertain, acrimonious times, but that can’t be an excuse to hold back. In fact, it’s a reason to engage. As Dr. Erica Taylor Southerland of Howard University points out, “There’s an entire generation of workers who don’t recognize this atmosphere as provocative. To them, it is the normal everyday.” This is a crucial factor for many communicators who came of age before the digital age. Today’s consumers have different experiences and expectations. If your company speaks out, will most be pleased and embrace your message? Will new customers be attracted to the brand? Will you alienate certain customers, influencers, or investors? When J&J joined other companies in pulling advertising from Laura Ingraham’s show to protest her criticism of Parkland shooting survivor David Hogg, there was pushback. Many Fox viewers responded, launching counter-boycotts using the hashtags #boycottJ&J and #boycottjohnson&Johnson. Were J&J’s actions worth the blowback? It’s arguable, but as a global health organization with a stellar brand reputation, it’s reasonable to weigh in on a public health matter. That’s not always the case. When Dodge aired a Super Bowl ad using a Martin Luther King Jr. voice-over to sell its Ram trucks, it faced a storm of criticism. If a company has no substantial or authentic connection to a cause or issue, it can descend into a quagmire of public skepticism. A company must be able to explain and support an advocacy position. The position should be expressed in an authentic way. Patagonia’s founder Yvon Chouinard is known to be utterly frank in his messaging, including his recent offensive against the Trump administration. It makes sense that an outdoor apparel retailer like Patagonia would take a public stand against the opening of national park lands for commercial use. But when companies trumpet sustainability programs but don’t back them up with behavior, it’s likely to be seen as greenwashing. When they do back it up with behavior, it’s called stewardship. Companies must weigh many factors when jumping into a divisive social dialogue – and they must do it fast. They want to drive the conversation, yet in today’s fragmented and fast-moving mediascape, controlling the narrative is impossible. “It’s almost lethal to try and be first (in speaking out),” said Johnson & Johnson CCO Michael Sneed. PR teams must take time to evaluate the implications and consequences of corporate speech. For example, Sneed sees his own company’s decision on the Ingraham show as too hasty, driven by the relentless news cycle. “We call it trigger process: something (an action) that could affect the whole organization… We took it from all sides,” was his observation. It seems that the best way to proceed is for corporate communicators to have a firm grasp of their organization’s values and those of its customers, so it can swiftly map public responses to the corporation’s value system. People have good reasons not to trust corporations, but “communications is the currency of change,” observes Jack Leslie of Weber Shandwick. With the veracity of journalists being questioned, the public relations industry may be in a unique position to step forward and be a force for truth. PR pros can help counsel corporations to speak out against wrongs, do good works, be authentic in words and actions, and do it all fast. This kind of strategic corporate activism can help to earn back the good faith of the American public.